Furniture Cleaning or Upholstery Cleaning requires a high level of knowledge, expertise and experience to be done properly. 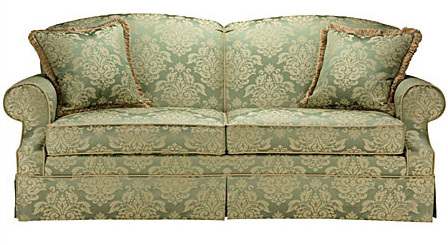 We have been upholstery cleaners in Memphis, Collierville and Germantown, TN since 1970. No matter what type of fabric is chosen for your furniture, throughout its eventful life, it will require maintenance and upholstery cleaning to keep it looking as new as possible. Furniture is perhaps one of the largest cash investments in most households, ranking with items such as the family car, carpets and a new kitchen. Also, fabric furnishings can get heavy use and show soil and dirt quickly. Therefore, regular maintenance (see upholstery cleaning & care guidelines) and professional upholstery cleaning will extend the life of the delicate upholstery fabrics significantly, as well as keeping them looking good. Upholstery cleaning by The Grayson Smith Company provides two benefits. It improves the appearance of the items and professional upholstery cleaning also improves and provides a healthier environment. 1. Upholstery cleaning for appearance: Typically, this is the main reason someone makes the decision to perform sofa cleaning and chair cleaning. 2. 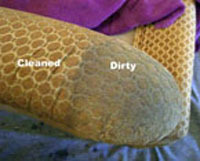 Furniture cleaning for health: Upholstery dirt is much different than dirt on your carpets or rugs. Upholstery cleaning deals with things like body oils, body dander, cosmetics, hairspray, body sweat and other fluids as well as food and drinks that may get spilled. Also, if you have pets that get on the furniture, animal hair, animal body oil and other animal fluids work their way into the furniture fabric. Even though your upholstery may not look dirty, dirt is accumulating through normal use. Therefore, it is good to extract this dirt periodically through professional upholstery cleaning, especially if you have children or pets. 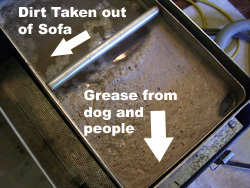 It takes years of experience to become knowledgeable in how to clean upholstery properly. Follow the simple guidelines below to keep all your upholstered furniture looking as new as possible. 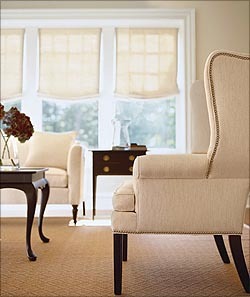 To avoid fading, keep upholstered furniture away from direct sunlight. Note: There is fabric protection that protects against fading from sunlight. Vacuum upholstered furniture often, even if your home furniture has seen little use. Dirt is brought in from outside and circulated through your HVAC system. So fine dirt will still settle on furniture in rooms with little use. For high-use furniture, the abrasive action of dirt and dust particles can wear the fibers of your upholstery fabric. So, it's a good idea to frequently vacuum and rotate the cushions. Avoid placing newspapers directly on home furniture upholstery fabric. Ink from the newspaper can transfer to the upholstery material and is difficult to remove. Never remove cushion covers for dry cleaning or machine washing, even though they have zippers. If the covers shrink at all, you will never get them back onto the cushions. Periodic professional upholstery cleaning will keep soil accumulation from marring the beauty of your upholstery.